When do you need a more intense anti-aging skin care treatment? If you have deeper skin issues like discoloration, dry patches, fine lines, or light scars. If you're over 50 or have significant skin aging, you probably could use more intense skin care treatments. Below are several options that could put more oomph for your anti-aging treatment. Consider using a combining of both mechanical and chemical exfoliation. NOTE: A treatment like this is only done a few times a year. It's not for the sensitive skin type. A good example of this would be the Skin Eraser. See how it works. This takes your anti-aging treatment to the next level. And please make sure to follow all instructions. For deeper mechanical exfoliation consider trying a microdermabrasion facial. 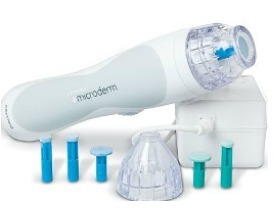 There are many at-home microdermabrasion machines that are pretty effective. Don't discount the potential of these hand held machines just because they're small. While the results won't be the same as a professional treatment, some home microdermabrasion machines are powerful enough to see smoothing results after the first treatment. In fact, if they're held in the same place too long, they can cause a red irritated burn mark! That's how strong mine is. I have to make sure I'm constantly moving the head back and forth across my face as instructed in the booklet. 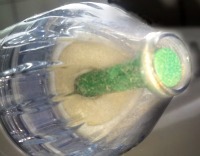 That little green disc inside the tip of my microdermabrasion wand is a patented, fast spinning crystal disc. That combined with the suction it creates pulls the skin close to the tip for a better and more intense exfoliation. But, it can irritate if left in place too long. That's why it's important to keep the head moving and follow all instructions. A mini-for-home use radio frequency machine is known to help tighten skin and stimulate collagen. The radio frequency (RF) energy releases heat deep into the subdermal to help stimulate elastin and collagen production. Different machines deliver different depths (amounts) of radio frequency current's to the skin. The at-home mini RF that I'm currently testing is considered bipolar - which means it offers superficial heating to the dermis. While the professional machines you find in dermatologist's and plastic surgeon's office are mostly unipolar which means it delivers a deeper dermal heating. 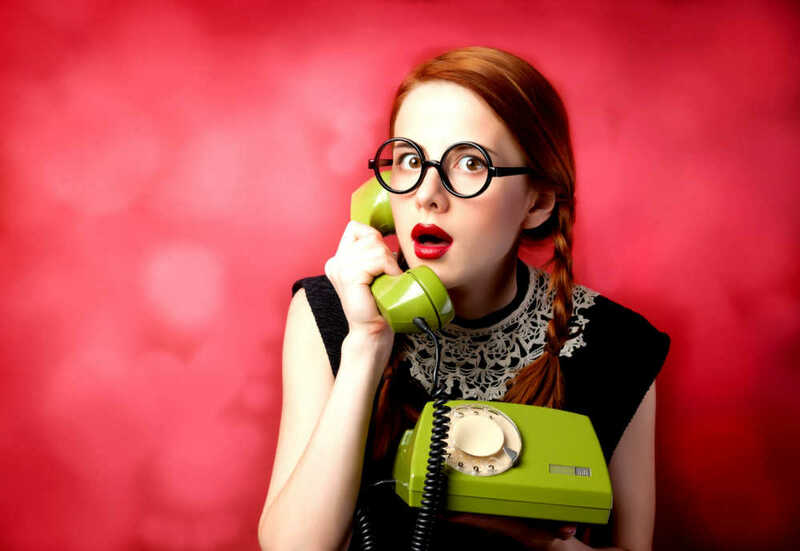 So are home-based RF facials a great option for anti-aging skin care treatment? While it's too soon for me to say since I'm only into my 2nd week of experimenting with my RF machine. 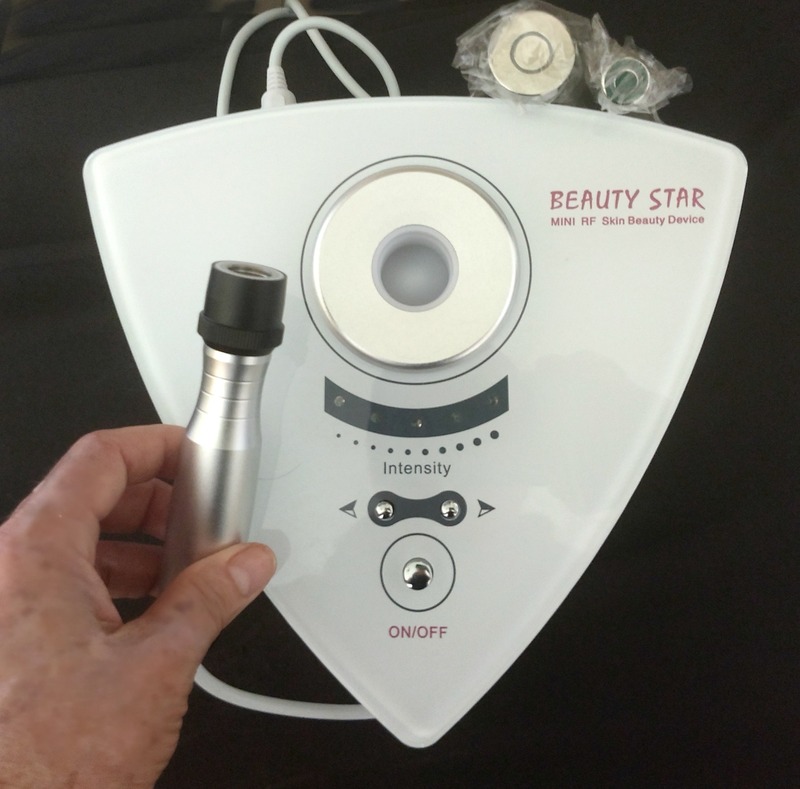 The study referenced above was done using the Silk'n Home Skin Tightening (HST) device, while I'm using the Beauty Star. The Silk'n puts out 1 Mhz radio frequency, the Beauty Star puts out radio frequency of 2 Mhz . Whether this makes a difference or not - we'll see. I'll report back here every few weeks to let you know how my results go. While deep heating and exfoliating the skin are wonderful options anti-aging skin care treatments, There is nothing like face exercises to stimulate blood flow, bring oxygen to the skin AND most important firm-up and increase the size of the underlying facial muscles. Since skin is attached to facial muscles, if the muscles are smooth and firm, so will be your skin. Of all the anti-aging treatments listed here - in my opinion - nothing comes close or can replace regular facial exercise. Except for maybe a face lift. Which face exercises should you do? That depends on your personal preference. It's highly suggested you check out some of the popular facial exercises on the market. Just make sure the program includes all the muscles of the face and neck and choose one that builds muscle mass, not just toning like many "yoga" type programs do. You really need to Build Muscle to get good results! The most important fact - find a facial exercise program you think you can stick with. I've purchased several different programs over the last 20 years and finally found one that I like. It's called CFF. You can click here to see what this program is all about and to try some anti-aging skin care treatment sample exercises.